The story of the Achilles wooden shoehorn began a few years ago when longtime joinery companions were thinking over a Christmas present for their friends and business partners. Finding today a modern and original gift is not easy. One day one of the companions came with the information that he just threw away another shoehorn and that it is terrible how poor quality they are. And so, the idea of inventing a wooden shoehorn started. Since then four years have passed, the shoehorn was developed. Now was the time to get the money for its production and sale. The original idea by itself was very innovative. Today, people are looking for original gifts, that are not only attractive, but also useful. That was the main idea behind the whole project, the company is producing hand made wooden products for more than 25 years. What they needed to be more successful was a new product, that is not at the market yet. 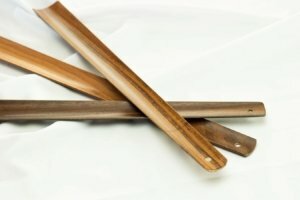 It was not an easy task, normal wooden shoehorn would be very fragile and would not last too long, when used every day. The company therefore started to develop a brand new wooden layered material that would be still made from wood, but much tougher, able to last at least several years. After 4 years development they ended up with their own patented wooden layered material Complig. Everything was ready for production, now was the time to focus on sale. That the was the main objective for the crowdfunding campaign. The company wanted to start the production and distribution, to create an e-shop and to use the campaign as a marketing tool to promote the new product. As a best time to start the campaign they have chosen the Christmas season, because the wooden shoehorn is an excellent Christmas gift. This decision was probably the main reason of the success. The product was chosen by several magazines as a suggestion for one of the most innovative Xmas gifts for the year 2017. That helped to gain attention from the public and the objective of the campaign was fulfilled very quickly. A Facebook page https://www.facebook.com/drevovoni/ as a main communication channel was created. For the campaign the company used Czech crowdfunding platform HitHit https://www.hithit.com/en/project/4294/lzice-na-boty-achilles, where also some videos proving the toughness of the product were posted. During the crowdfunding campaign they reached more than 5,800 €, which was 149 % of the expected amount of required funding. Three examples of Crowdfunding for toys Can crowdfunding be applied to schools and other public utilities?